Nonzero Dispersion-Shifted Fiber (ITU-T G.655) includes Lucent truewave fiber and Corning LEAF fiber. 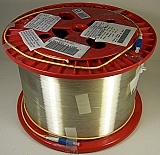 10km to 18km Lucent truewave-RS fiber spool. 25.278km or 30.275km Lucent/AT&T Truewave "-" fiber spool. With negative dispersion around 1550nm. With FC/PC fiber connectors. "UFO" Fiber. With actual dispersion test data. 25.1km Lucent Truewave "-" fiber spool. With negative dispersion around 1550nm. Without fiber connectors. Fiber ID number ending with "DXD".